There are many people who would easily rank public speaking as more fearful than death itself. This valuable, action packed book aims to transform that fear into courage. By concentrating on the goal for the presentation instead of people’s impressions, the author believes the fear will diminish. 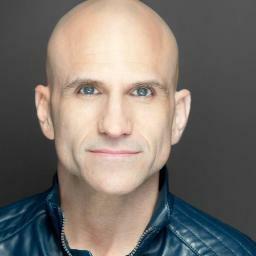 Michael Port is a former actor and best-selling author, who now helps people deliver show-stopping performances by speaking at corporate events. His recent book, Steal the Show: From Speeches to Job Interviews to Deal-Closing Pitches. How to Guarantee a Standing Ovation for All the Performances in Your Life by Michael Port, distills actionable advice for novice and advanced speakers as well. Whether you’re prepping for an interview, sales call, or presentation to the board of directors, Port’s advice will have you feeling confident and engaging your audience. Prior to your show-stopping performance though, it’s important that your authenticity comes out. "Finding your voice is important for your results. If you want to play different roles authentically and amplify or downplay different parts of your personality to do so, it’s important to be comfortable with who you really are and what you stand for so you never lose sight of your values." Having the courage to be you, or finding your voice as Port calls it, is not easy. But then again, if you want to shine and put on the best performance of your life, you have to leave your comfort zone. Many of the biggest accomplishments have been achieved when we step outside our comfortable spots and push the limits. One of the first steps to being yourself is to let go of your inner critic. Stop being so hard on yourself and don’t be afraid to take a chance. Port asserts that reducing self-criticism can boost the natural conviction that what you have to say matters as much as anyone else. Providing a personal story that’s related to the message you’re sharing can boost your authenticity. Port also reiterates the importance of not making your presentation goals unattainable. In other words, you don’t have to have all the answers or solutions. Admitting you don’t know something can increase your credibility with the audience. A great place to start boosting your credibility is through improvisation. "Every speaker faces difficult situations and surprises at some point—improv is great training for saving those moments during a performance." Learning to improvise is a great resource for improving your presentations. It boosts your confidence, increasing your adaptability to handle any situation. Improvising also sharpens the skill-set needed to deal with difficult moments when things don‘t go as planned. A group exercise Port suggests to improve your improvisation techniques is the story game. A theme or setting is provided to the group as well as an opening line such as, The cat jumped over the moon. The first group member then proceeds to build on the opening line until the facilitator says next, and the story-line then moves on to the next person and so on. Another technique that the author refers to throughout the book is to adopt a mindset of yes, and. Saying yes and, “begins the positive cycle of creative, productive problem solving.” It’s about having the courage to explore all possibilities to find out what works and what doesn’t. Saying no shuts down creativity, discourages audience engagement and prevents creative dialogue. "Showing empathy for the audience means I’m paying attention to how they are listening and what they are feeling." A key step for being in the moment during your big presentation is to be prepared and well-rehearsed. Preparation gives you the confidence to be present and in the moment because your brain is not so focused on remembering the material. It allows you to pick up on the audience’s visual cues and be a better listener. When listening, clear your mind of anything other than what is being said and try not to plan your response until the person has finished speaking. Port also reiterates the importance of using all your senses to notice people’s reactions after something is said. Is the audience getting restless or tired or are they paying attention to every word, writing down notes? Sensing audience engagement or lack of it allows you to connect with the audience. Being in the moment is all about being present. To fully engage the audience, you have to be aware of what’s going on. This valuable book summarizes many practical tips from Port’s acting background and public speaking successes. Following his advice will boost your confidence and presentation skill sets, and help you to steal the show at your next presentation.